"Well, he needed killing." - Mark Twain, "Pudd'nhead Wilson," 1894. 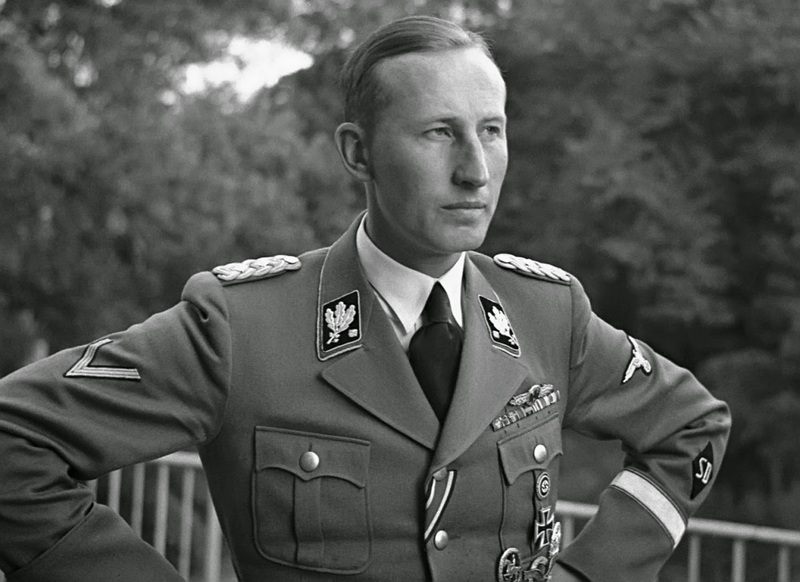 Reinhard Tristan Eugen Heydrich (7 March 1904 – 4 June 1942) holds a unique place in world history. He set the Holocaust into motion and was the true evil center of the German regime. Even Adolf Hitler was awed by this fellow's malevolence, noting quite perceptively that Heydrich, out of all of the blackhearts surrounding him, was "the man with the iron heart." Among a crowd of lackeys, imbeciles, and unredeemable thugs, Heydrich stands out as the one man who not only seethed with utter hatred mixed with emotional indifference for the welfare of others but also knew exactly how to do something about it. He was, at that iron heart, a psychopath. 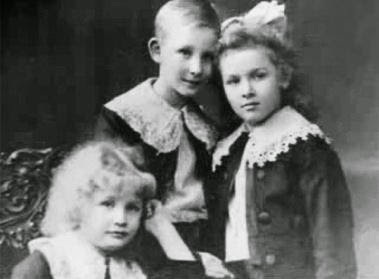 Heydrich and his siblings. He is in the middle. Note that they are nicely dressed, this is an affluent family. Reinhard Heydrich was born to a composer and opera singer, Richard Bruno Heydrich, so he was named after Germanic operas. While his father is long forgotten, Reinhard was raised in affluent surroundings and quickly developed a love of music. With a strict, nationalistic father, Reinhard did well at school and was quite patriotic. Many of his classmates thought that he was Jewish for whatever reasons, and they took to calling him "Moses Handel" and bullied him. Young Reinhard took the insults hard, and they festered throughout his life. 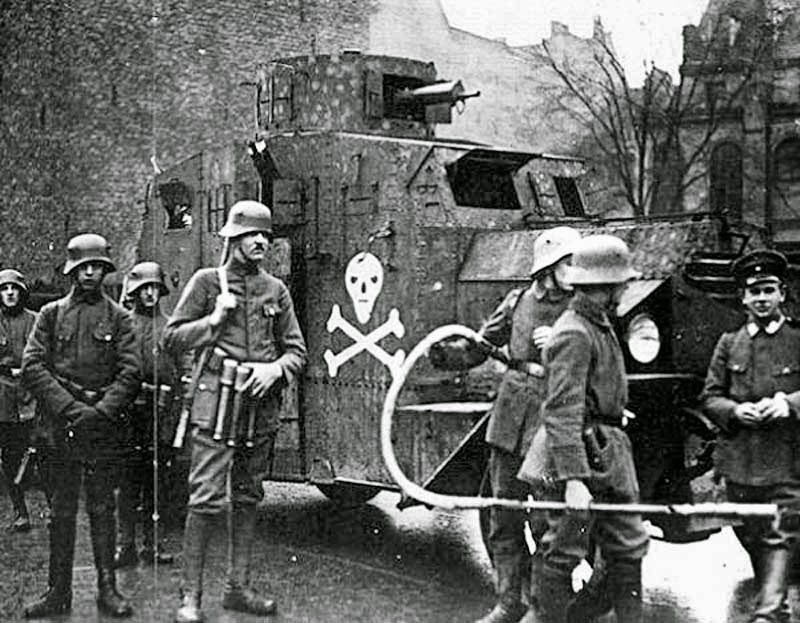 Some Freikorps troops using an armored car in Munich. The relationship between the unofficial Freikorps and official German troops was often fuzzy at best. Too young to fight in World War I, Reinhard joined the first Freikorps unit in all of Germany and remained in it after the purpose of its formation (to protect his hometown, Halle, from communists) had been accomplished. Afterward, he joined the anti-Semitic Deutschvölkischer Schutz und Trutzbund (National German Protection and Shelter League). Times were tough after the war, and opera singers/teachers were not in high demand when people were starving. Reinhard joined the German Navy (Reichsmarine) as soon as he could for its financial security. He advanced rapidly through the ranks, always pleasing his superiors, and by 1928 was a sub-lieutenant, similar to a Lieutenant jg in the United States Navy. There, he became good friends with Admiral Canaris, who later became head of the Naval Intelligence Service, the Abwehr. However, trouble developed for the attractive young officer because of his romances - after breaking an engagement to one woman in order to marry another, Admiral Erich Raeder dismissed Reinhard from the Navy entirely in April 1931. He did marry the second woman, Lina von Osten, soon after. 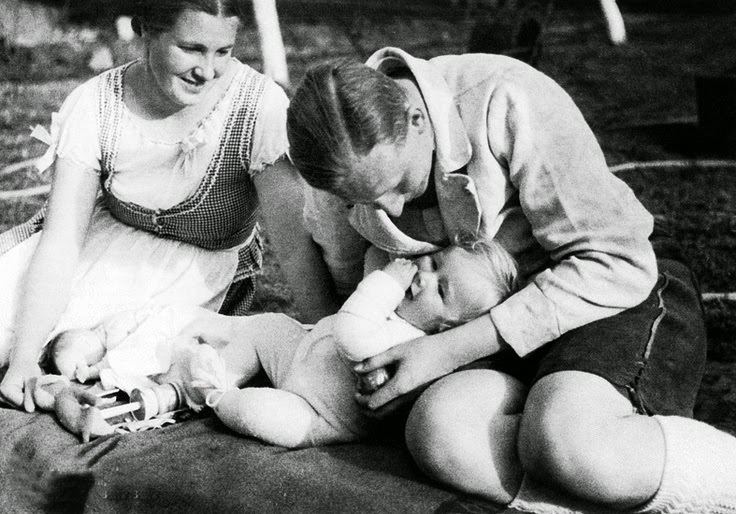 She was an even bigger fascist than Heydrich, having joined the Party years before he ever thought about it. She was the first and most vital link to his ultimate fate. Reinhard with his wife and son. With no prospects and his pension gone, Reinhard looked about for opportunities and quickly found one: SS boss Heinrich Himmler. Lina was friends with a friend of Himmler, and upon meeting Reinhard, Himmler liked the former Naval officer and hired him on the spot. Generally, if you were in good with Himmler, all doors opened for you, as was also the case with Joachim Peiper. Himmler was just getting his operation up and running, and he needed reliable underlings. He appointed Heydrich to be in charge of the new intelligence service, the "Ic Service." It was a fateful appointment. 'I doubt if I would ever have married him if he had not played the violin so beautifully.' Lina Heydrich [nee Lina von Osten] reflects on her late husband. They used to play together with Canaris' wife. There is no question that Heydrich was both clever and diligent. He began assembling a network of spies and informants, a network that he used for both official purposes and his own advancement. Reinhard had a Rolodex full of information on all the key players in the Reich. Himmler thought the young man was exceptional and promoted him to the rank of Major (SS-Sturmbannführer) as a wedding gift that December. 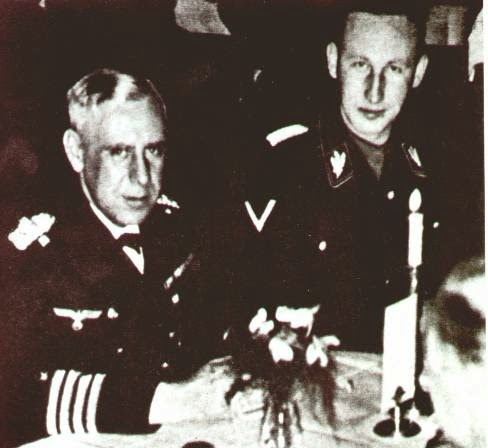 Heydrich and Canaris, taken at Horcher's restaurant on 17 January 1935. Horcher's was a favorite of bigwigs such as Hermann Goering, who even had them cater affairs at his Carinhall estate. 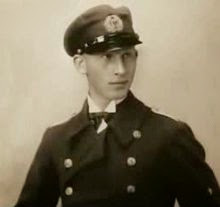 Heydrich had met Canaris in July 1923 whilst stationed together on the Cruiser "Berlin," and Canaris mentored him (both Heydrich and Canaris' wife Erika played the violin) until Heydrich eventually became a party favorite. They remained friends and neighbors in Schlachtensee until Heydrich's death in mid-1942, though their professional relationship soured during the war when they were involved with different intelligence agencies (Abwehr and Sicherheitsdienst). 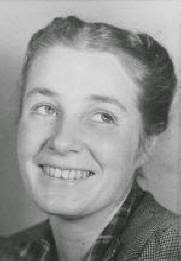 Neither survived the war: Canaris was executed in the last days of the Reich (9 April 1945) for suspected participation in the 20 July 1944 attempt on Hitler's life. Naturally, others took notice of Heydrich's rapid rise, and they began to feel threatened. There were several ways to get rid of colleagues in the Third Reich if it would help you advance, and one of the most promising was to prove that your antagonist was of Jewish descent. This wrecked some careers and very nearly destroyed many others, and Admiral Wilhelm Canaris, who ran his own, separate, naval intelligence service and for whom Heydrich's past indiscretions would have had greater meaning as they happened in the Navy, tried it on Heydrich. Even mere rumors of such ancestry could be poisonous, and top leaders (such as Luftwaffe boss Erhard Milch) went to extreme measures to sterilize such allegations about themselves. This photo often is misidentified as various other people. However, I am confident that this is a pre-war shot of Heydrich, complete with ceremonial sword. Not only that, I would bet this was taken during a Parteitag (NSDAP Party Celebration) in Nuremberg - but that is a complete and utter guess. Party boss Gregor Strasser (before being knocked off by Hitler, Hermann Goering, and Heydrich in the Night of the Long Knives) passed the allegations on to Party racial "expert" Dr. Achim Gercke. Gercke cleared Heydrich completely, calling Heydrich "... of German origin and free from any colored and Jewish blood." This was the equivalent of a dispensation from the Pope. Who knows, Heydrich's Rolodex information may have come in handy for that matter. Canaris, incidentally, ultimately died in Auschwitz after evidence was adduced that he was, in fact, a foreign spy. With Heydrich in the clear, in 1932 Himmler promoted him to be in charge of the Sicherheitsdienst (SD). The SD was a shadowy organization that Himmler ostensibly used for counterintelligence, but in reality, was used to spy on Himmler's rivals and foreign diplomats for political purposes. It used phone taps and the like. The SD also was yet another paramilitary outfit, and Heydrich used some men from it in 1933 to take over police headquarters in Munich. This made Himmler the Munich police chief (in addition to everything else) and Heydrich in charge of the "political police." The only one who could have stopped such shenanigans was Hitler, but the Chancellor was only too happy to see "Der Truer Heinrich" eliminating potential internal opposition. It was a time of immense change within Germany, with Hitler taking over and the gradual imposition of a police state. Herman Goering was technically Prime Minister of Prussia, and he created the Gestapo as a Prussian police force. Himmler and Goering were tight, and Goering, preoccupied with many other things such as the Luftwaffe and the Four-Year Plan, turned the Gestapo over to Himmler. Himmler, in turn, made Heydrich the boss of the Gestapo on April 22, 1934. 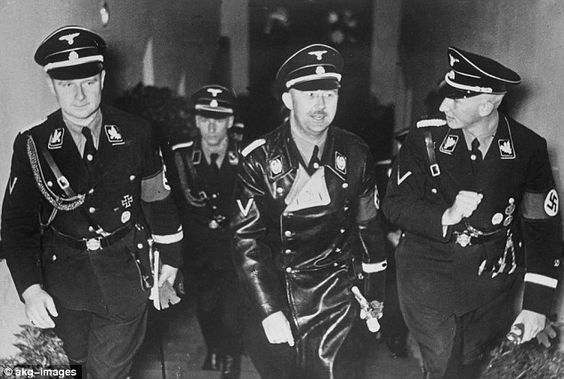 The timing is critical because Himmler needed someone reliable in place to make sure that events that were being contemplated were handled with cold smoothness and implacability - as they ultimately were. 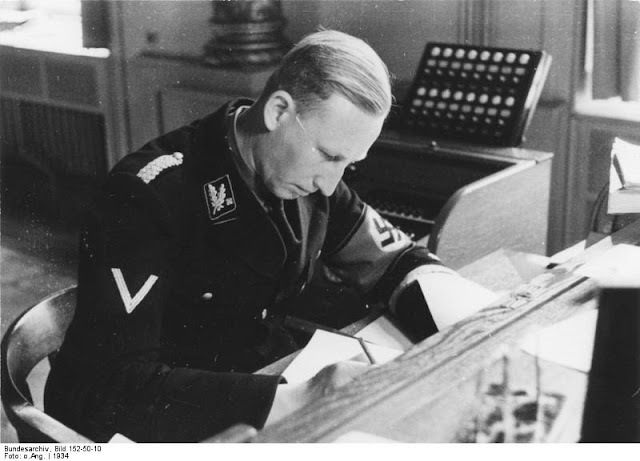 SS-Brigadeführer Heydrich, head of the Bavarian police and SD, in Munich, 1934. Unlike most photos like this, taken to suggest their subject was hard working - this one was pretty accurate. Heydrich worked hard to kill and destroy others. Hitler had risen to power with the strong-arm support of the Sturmabteilung (SA), the Party's own paramilitary organization that was not dissimilar to the old Freikorps. Goering had headed it, but since then it had passed through a number of hands until one Ernst Röhm took over. Röhm was an interesting character, and, unfortunately for him, an independent one. He believed in asserting his and his organization's "rights," which increasingly appeared to Hitler to have political overtones. 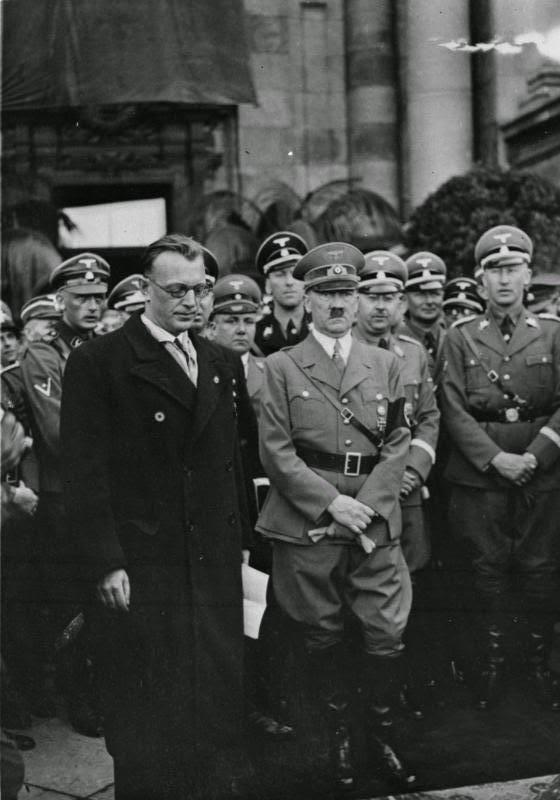 If there was one thing that Hitler could not abide, it was anyone else in Germany with political aspirations, and Röhm appeared to be such a man. Heydrich, careful to stay a step behind his boss. Additionally, as Chancellor of Germany, Hitler no longer had any need for the crude SA, which as a political entity increasingly served no useful purpose. In April 1934, Hitler began talking to Goering about eliminating this nuisance, and Goering pulled in Himmler. Himmler, in turn, saw the need for someone reliable who would take care of the nuts and bolts - Heydrich. Thus the appointment of Heydrich to head the Gestapo. 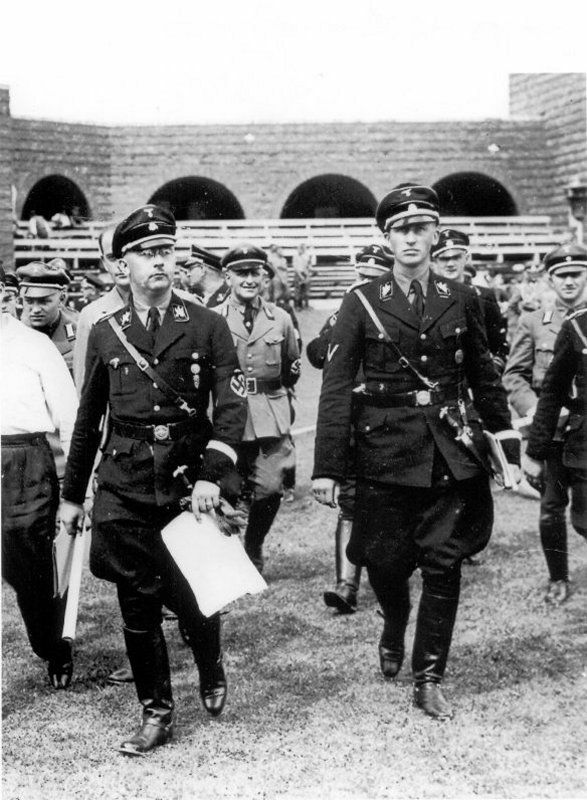 Heinrich Himmler and Ernst Röhm. Goering pulled the boys together and they all chipped in names of annoying people to be knocked off. It was as crude and simple as that. One of Röhm's underlings, Viktor Lutze, had been informing on Röhm's subversive activities, and he, along with Goering, Himmler, and Heydrich, planned out the entire affair. On June 30, 1934, they struck, with arrests and summary executions continuing for two days, Heydrich playing a key role. They eliminated Röhm, and Lutze took over the SA and promptly made it completely irrelevant, exactly what Hitler wanted. Once again, Heydrich had proven his loyalty and usefulness. The German regime at this point was shifting into second gear, and there was an opportunity for enterprising young men to shape amorphous organizations into precise tools of their own device, as Himmler was doing with the SS. Heydrich began re-working the Gestapo from a mere police force into the prototype of the police-state enforcer. The Gestapo gradually acquired increased powers with no oversight, such as the right to arrest anyone on the mere suspicion that they might commit a crime, which is completely wacky and could justify arresting just about anyone for anything. This euphemistically was called taking them into "protective custody." In essence, the Gestapo began acting as the regime's bullies. With President Paul von Hindenburg having passed away in August 1934, Hitler became Fuhrer, and it was no longer necessary to have independent security organizations that could spy on the State - because the Germans now were the State. 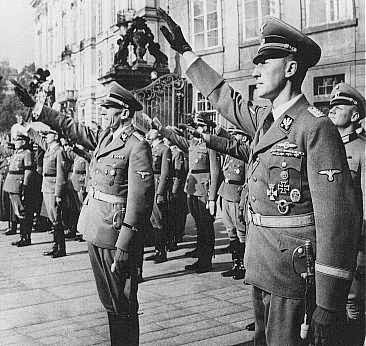 On June 17, 1936, Himmler officially took charge of all the police forces in Germany and reorganized them. There now were ordinary police, or Ordnungspolizei, and Security Police (Sicherheitspolizei ), which included the Gestapo. 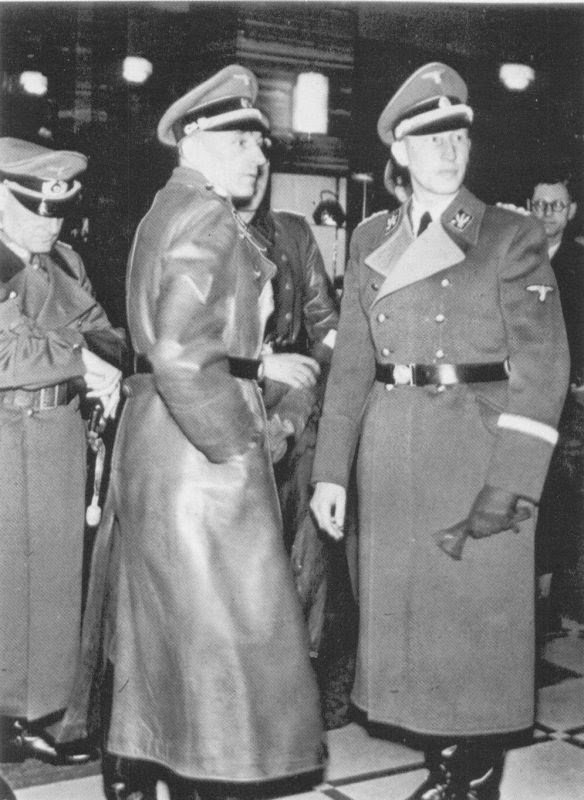 Heydrich now commanded the Security Police and retained the SD, while Heinrich Müller ("Gestapo Müller") took over the Gestapo. Clearly, Heydrich was not about to let the source of his own power, command of the SD, slip out of his hands. 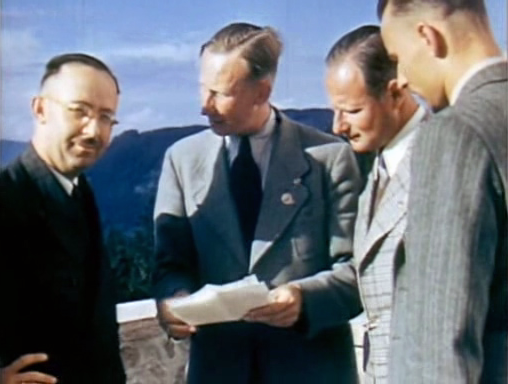 Reinhard Heydrich (middle) with Heinrich Himmler (left), Karl Wolff (right), and Hermann Esser (far right, back to camera) at the Obersalzberg, May 1939. 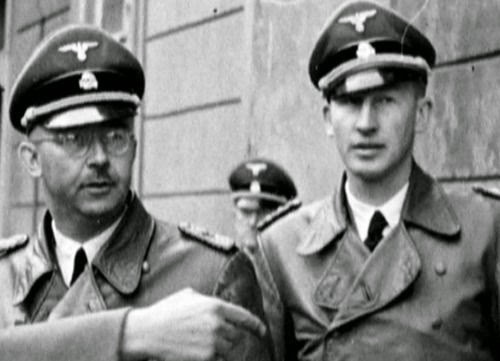 Himmler could smile and act nonchalant because he had people like Heydrich to do his dirty work. With everything in order, Heydrich now began to organize the 1936 Olympic Games in Berlin. 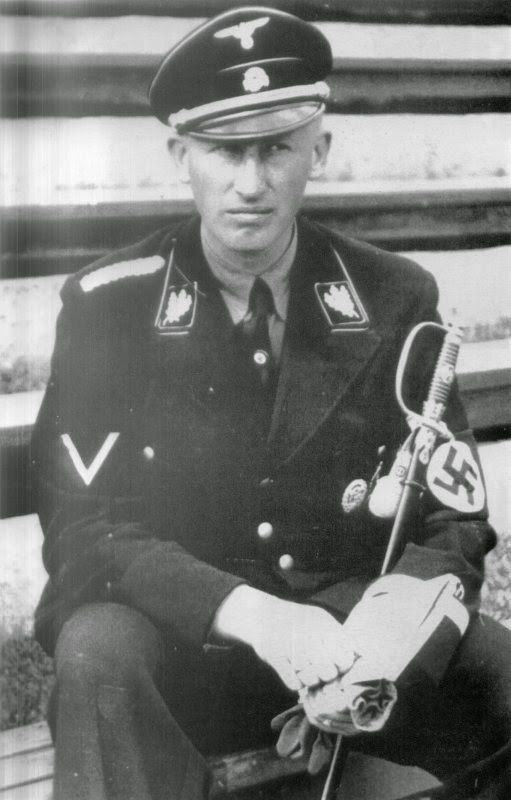 Organizing was something that Heydrich was good at, and he accepted a German decoration (the Deutsches Olympiaehrenzeichen) for his services. After that, he turned his attention to public opinion and had his people begin surveying the public and arresting etc. anyone whose opinion wasn't the best in terms of loving the Hitler regime. It wasn't exactly the Gallup organization, so many people likely were caught up in the purge who shouldn't have been. 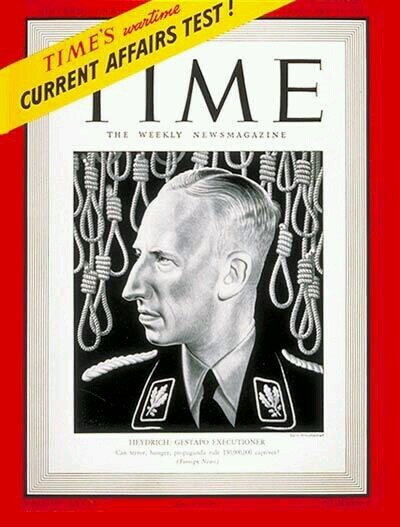 Heydrich hit the big time on the cover of Time Magazine. 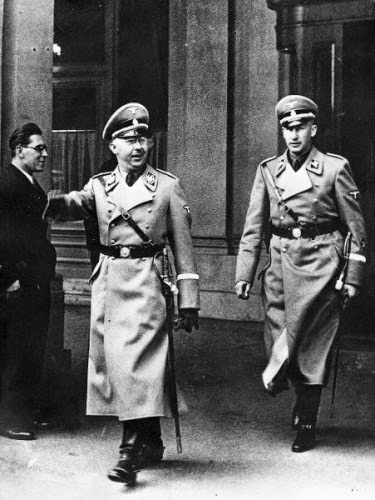 Heydrich also helped Hitler with taking over Austria by organizing street demonstrations and related activities in Vienna. Anschluss with Austria soon followed. Heydrich was a key organizer, at the behest of Propaganda Minister Josef Goebbels, of Kristallnacht in 1938, which many pick as the conception of the Holocaust. He later helped Himmler implement Operation Himmler, the German-instigated Polish "provocations" of Germans wearing Polish uniforms along the border during the summer of 1939 that led directly to World War II. 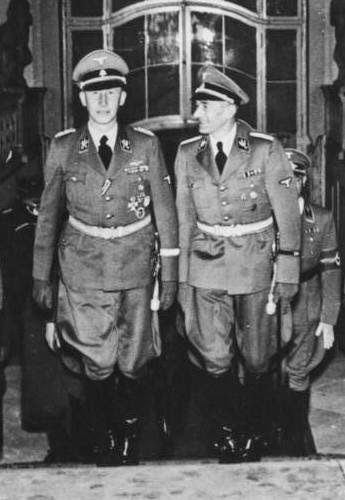 Heydrich kept consolidating his own power under Himmler and receiving promotions from his grateful boss. He became President of Interpol and an SS-Obergruppenführer. His power, though, ultimately was Himmler's, simply delegated to him. Heydrich also attempted to meddle in Stalin's purges of the Red Army military of the late 1930s, but Stalin did exactly what he wanted to do anyway and Heydrich accomplished nothing there. 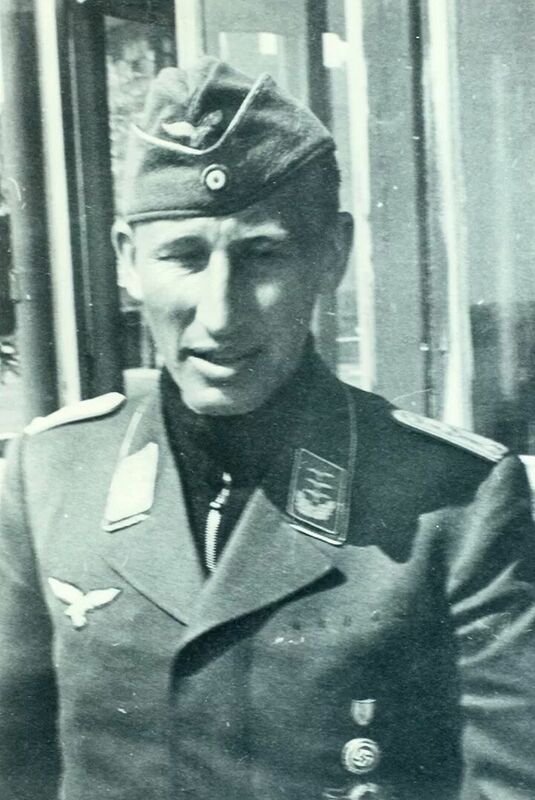 Heydrich in his Luftwaffe uniform. Heydrich did, though, have success when Hitler instituted the Night and Fog decree of 1940 (Nacht und Nebel). This was simply an extension of the Gestapo's existing powers to arrest anyone for any reason, but now the German security services didn't have to tell anyone about the arrests - the people simply disappeared forever. Karl Wolff, Himmler, and Heydrich. Heydrich posed as a tough guy. 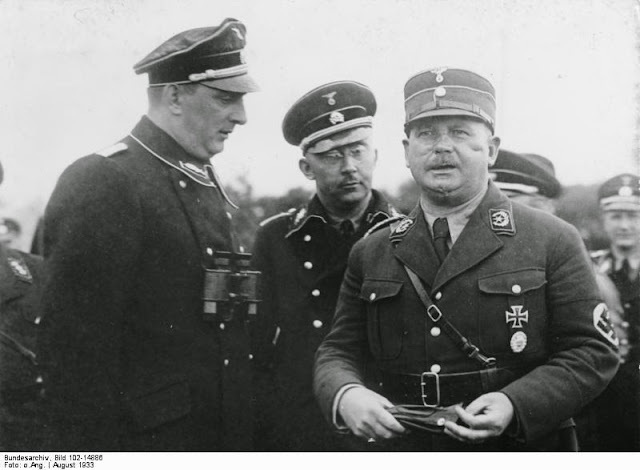 However, SS General Karl Wolff, a man widely regarded as the eyes and ears of Heinrich Himmler, head of the SS, later recalled an incident with Heydrich and Himmler which showed the reality. For the Thames TV documentary "The World at War" in the early 1970s, Wolff recalled how both Heydrich and Himmler had vomited at the sight of Jews being shot in a pit at Minsk. Heydrich now was at the height of his powers. 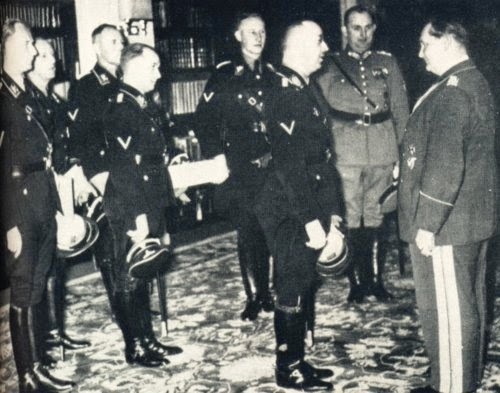 Hitler was appreciative of the capable officer and on September 27, 1941, made him Stellvertretender Reichsprotektor (Deputy/Acting Reich-Protector) of the Protectorate of Bohemia and Moravia. Hitler wanted a tough approach taken with the Czechs, and there was nobody tougher than Heydrich. As Heydrich said, "We will Germanize the Czech vermin." Yes, nice guy, right? A rare candid shot of the SS bosses. 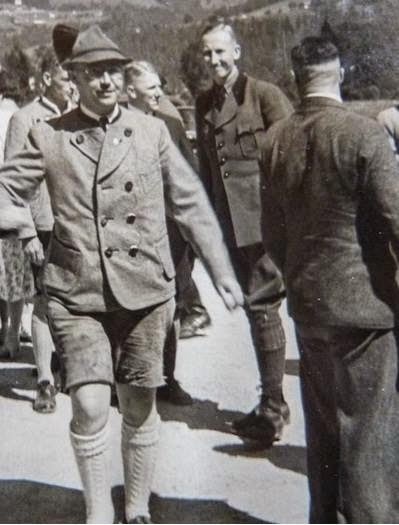 Heydrich obviously is intrigued by Himmler's uncharacteristic native garb. Heydrich soon arrived in Prague and clamped down to help the German war effort, which was showing the first faint signs of bogging down in the far reaches of the Soviet Union. The Czechs were not particularly enthusiastic about the war, and Heydrich aimed to change that. He began executing people immediately, and all vestiges of an independent Czech culture began to disappear. He organized sweeps against anything within Czechoslovakia which was Czech and not completely German. He became known as "The Butcher of Prague" (which echoes a scene in the Jack Benny comedy "To Be Or Not To Be" from around that time). The ultimate goal was clear: eliminate the Czechs and replace them with Germans, and whether the inhabitants lived or died was a matter of unconcern. Czechoslovakia, after all, had been mostly German before World War I, so the Germans barely recognized it as a separate state at all. Many of the people in it were what were known as 'ethnic Germans,' meaning they were not Slavs and retained a German heritage. Czechs were drafted into slave labor, and Heydrich ran the entire state singlehandedly. Being a Gauleiter was not nearly as prestigious as being, say, an army General, but it was definitely a worthy post and a reward to Heydrich for his hard work and fanaticism. For someone who had been little more than a glorified office clerk only a few years before, it was quite a promotion. Being safely in the heart of the German empire, the post also was more administrative in nature than some of those where there were active partisan movements and the like, such as in Yugoslavia or Russia, so it fit Heydrich's desk experience nicely. It was during this time that Heydrich organized the infamous "Wannsee Conference" at an SS building in a Berlin suburb on January 20, 1942. 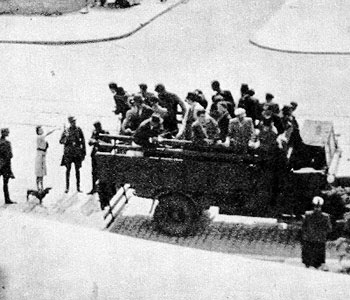 Previously, Heydrich had organized the Einsatzgruppen ("special task forces) on the Eastern Front to cleanse the area of Jews, but that had involved inefficient shootings and hangings: now the Germans wanted to shift that program into higher gear and turn these killings into mass murder on an industrial scale. Without any guidance or plan, Heydrich convinced the other government agencies to assist him in sending all the Jews they could find east "to build roads." It was not necessary for him to explain to them what would happen to them after the "roads" were built: they weren't coming back. Meanwhile, back in London the Czechoslovak government-in-exile observed all this with growing horror. 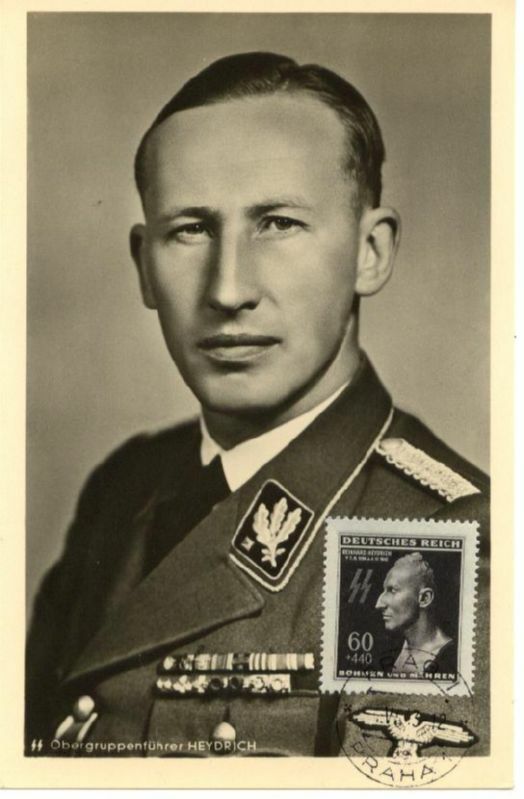 Heydrich was in the process of eliminating an entire culture, the Czechs, while he was also in the process of eliminating an entire People, the Jews. This could not be. Historians after many years of searching identified the Mercedes 320B in which Heydrich seventy years ago met his assassins. 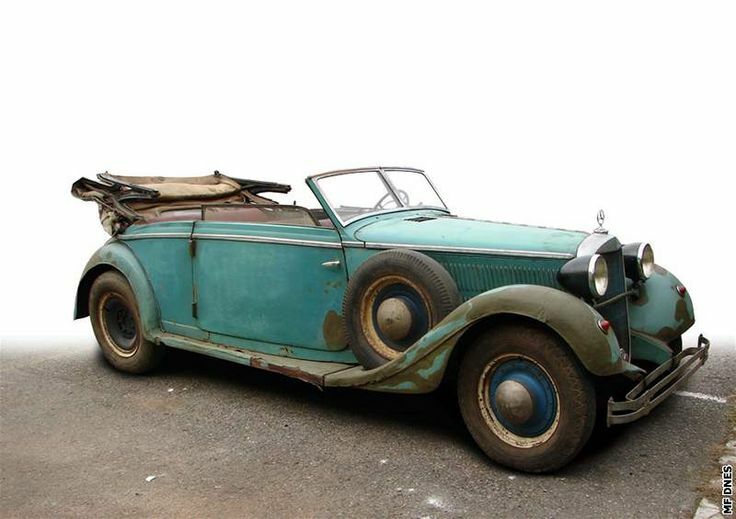 The car was uncovered in a village barn near Hradec Králové (Czech Republik) by businessman Vladimir Macek, whose firm is dedicated to reconstruction of historic vehicles. One of the more impressive barn finds. 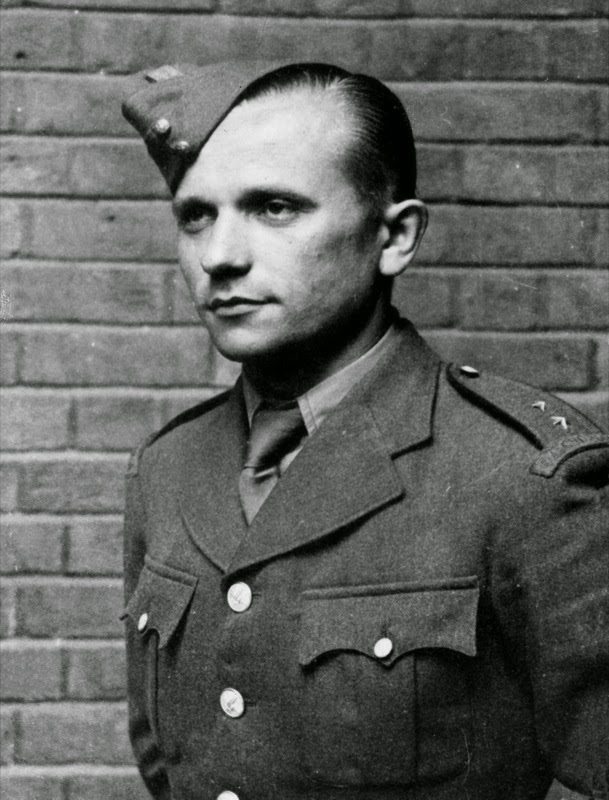 They trained two agents (Operation Anthropoid), Jan Kubiš and Jozef Gabčík, with the help of British Special Services. The pair parachuted into Czechoslovakia from a converted Halifax bomber late in 1941. They spent several months in hiding. 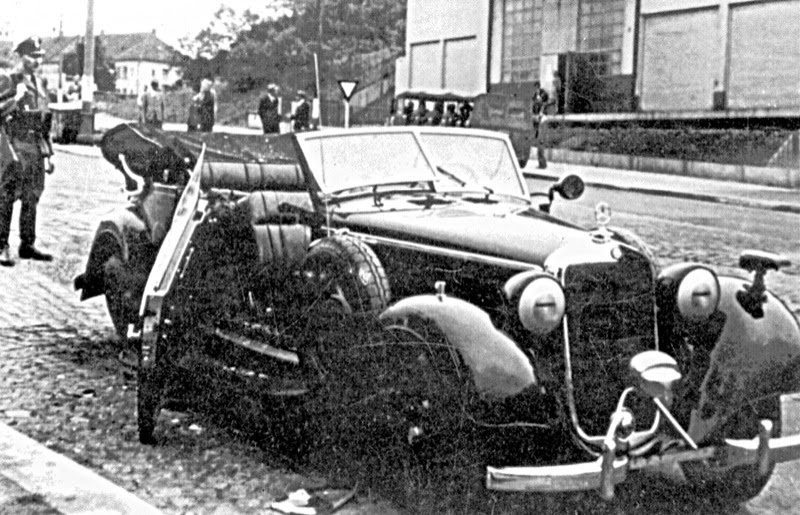 They waited until May 27, 1942, and then ambushed Heydrich as he drove by on a sharp bend in a road in the Prague suburb of Holesovice. Glabcik was supposed to have the honor of the kill, but his gun jammed. Heydrich, offended by this blatant sign of opposition, had his driver stop the car, stood up, and began yelling and/or firing his pistol at the attackers. 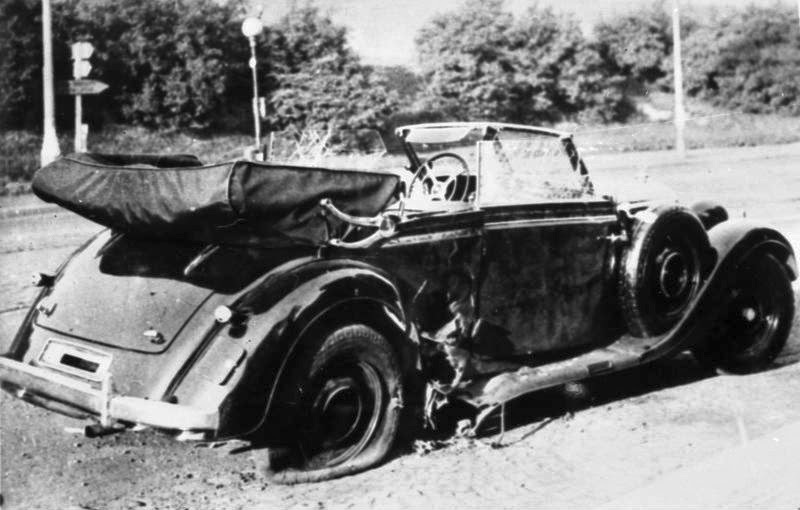 Hardly believing their good fortune, Kubis, the backup man, then threw a grenade into Heydrich's open car, which didn't do all that much to the car but badly wounded Heydrich. 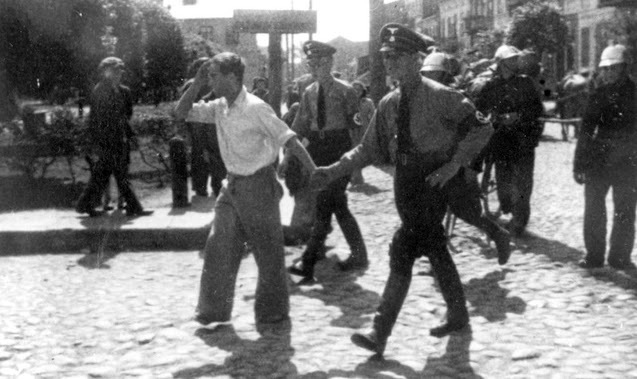 However, the Deputy Reich Protector was not done quite yet with these miscreants: incredibly, he then jumped out of the car and began chasing the attackers with his pistol. 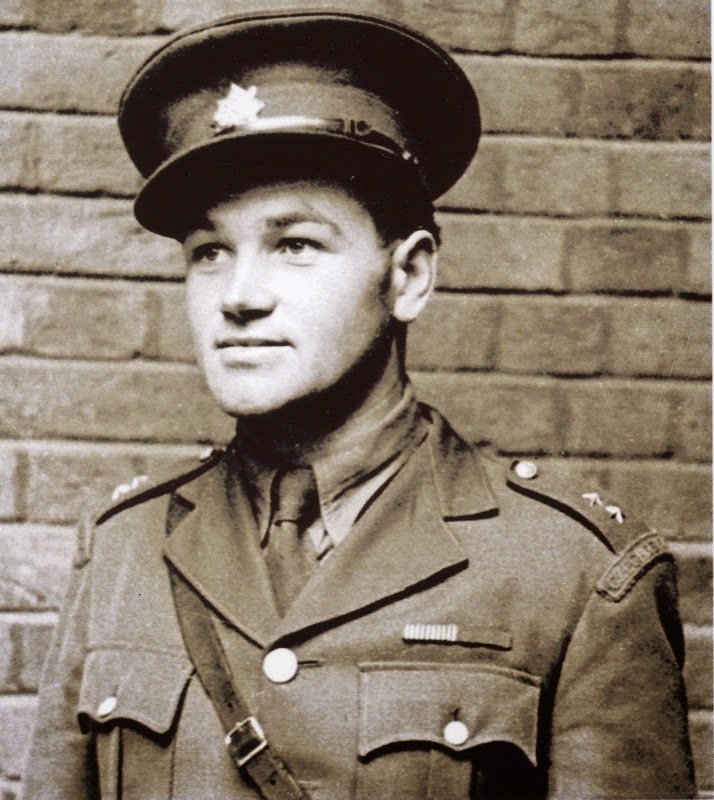 Physiology could not be denied, however, and he soon collapsed from loss of blood, and the attackers escaped by foot and bicycle and went into JINDRA safe houses (and were later found and gunned down by the SS). Taken to a hospital, he regained consciousness and everything possible was done to save him, but he passed away a week later, on the morning of June 4, 1942. Heydrich's reign of terror, though, wasn't quite over just because he had died. The SS and Gestapo (700 soldiers) soon cornered the agents who had killed Heydrich after they had been betrayed by a fellow Czechoslovak soldier. It was a church - perhaps they instinctively thought of the medieval concept of sanctuary - where they committed suicide with their last bullets. The Hitler regime wasted no time in deifying Heydrich. This is a postcard of him, featuring a stamp of his death mask. The stamp is canceled in Prague. The Germans knew how to create a martyr, they had been doing it for 20 years at this point. A massive state funeral for Heydrich, the grandest of the Hitler era, was held to demonstrate Hitler's dominion over the province. In some ways, it was the absolute height of German dominance over occupied territories. 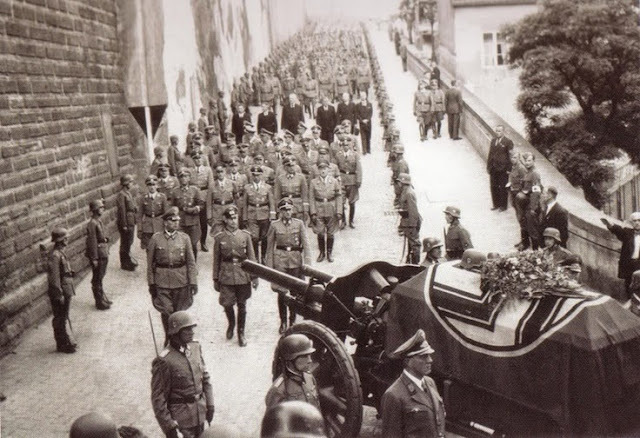 Heydrich's funeral. Three men following the coffin: from the left - Deputy Protector Kurt Daluege, Heinz Heydrich (brother) and State Secretary Karl Hermann Frank. Prague, 6 July 1942. After one of the biggest state funerals of the war, Hitler went on a rampage and ordered two Czech towns punished in reprisal based on false Gestapo evidence implicating them in the ambush. The documents suggested that the villages had harbored the agents. Accordingly, the two innocent towns, Lidice and Ležáky, suffered the wrath of the entire German state apparatus. The children were deported and the adults murdered. The towns then were blown up and ceased to exist, with German newsreel footage gleefully showing their destruction. This footage received worldwide media attention and was shown in theaters across Allied lands. 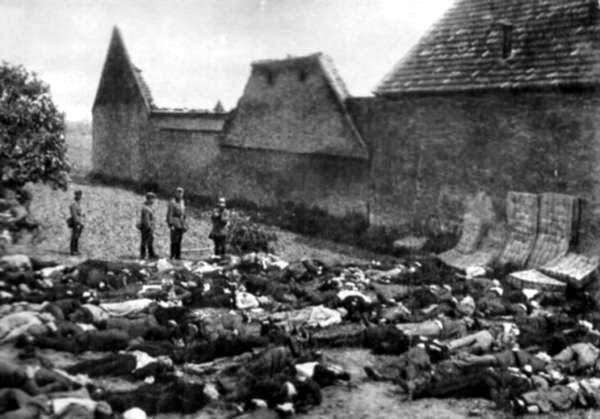 Lidice massacre. The town was then blown up. The results of the Wannsee Conference over which Heydrich had so skillfully presided were much more heinous and could not be stopped by assassins hand grenades. The decisions that Heydrich rammed through there resulted in the worst of the Holocaust, in which untold millions of people were murdered by Heydrich's organization. The project of building the death camps in Poland was sentimentally named Operation Reinhard, in honor of the evilest man in World War II Germany. 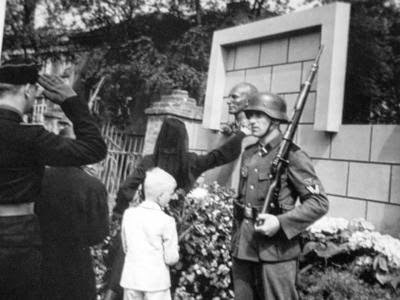 Lina Heydrich at the memorial of her husband in Prague. As a final thought, ponder this: there were many horrible, cruel, vile monsters in the German regime. Julius Streicher, for instance, came up with Der Stürmer, a vile anti-Semitic newspaper, and also published children's books - children's books - designed solely to make little kids hate Jews. Josef Mengele had children decapitated so that their heads could be sent to an SS lab to be studied for the causes of epidemic outbreaks. Heinrich Himmler created the death camps and, unlike all the other top dogs, actually visited them to make sure they were killing people just the right way. Himmler pointing at the worst of the worst. But Reinhard Heydrich, Reinhard Heydrich was the only one they ever sent a hit squad against. Hope you find the data plausible and convincing. Canaris was promoted to Rear Admiral rank in January 1935 and in the photograph he is wearing the appropriate cuff band. Great to learn more about this. Thanks for the nice post. Das was gut!!! Sehr gut!!! As far as I know, Heydrich did not see any execution in his life. Himmler saw several (even before Minsk), But I could not find ANY evidance that Heydrich saw one. He may was too timid (& there's a line Himmler said about him in his funeral that confirms it). Dear Mr. Bjorkman but the Mercedes 320 B of the attack is black or green? "The Odyssey of Goetz von Berlichingen"